When I stumbled across this video by a group called Questions from Atheists, I was keen to share it with everyone. I have noticed in the comments section, however, that atheist trolls keep raising specious counterarguments that need to be addressed so that they can be dismissed. So here are my answers to questions to Questions from Atheists. In Genesis 17 God makes an agreement with the Jews that He says will last forever. If the Jews ceased to exist, it would cast doubt on God’s existence. 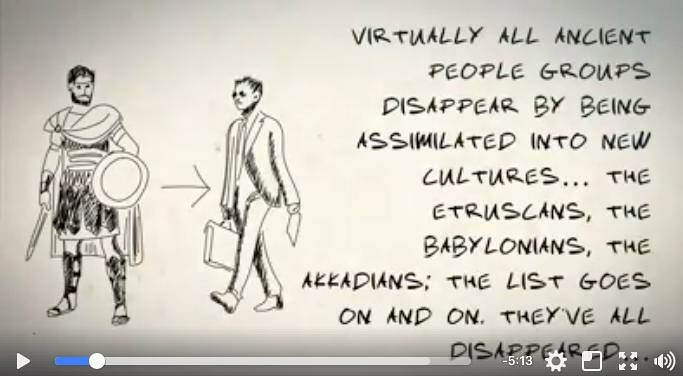 Virtually all ancient people groups disappear by being assimilated into new cultures . . . the Etruscans, the Babylonians, the Akkadians: the list goes on and on. They’ve all disappeared except the Jews. Despite all odds they continue to exist. So far, Genesis 17 is verified. Answer: It’s sometimes difficult to pinpoint exactly when a nation comes into existence and when it has been assimilated into another group or changed so much that it disappears. The Egyptians had no patriarch, no Abraham, Isaac, Jacob, Judah, etc., no precise moment in history at which they just began. The Egypt of today was once two separate kingdoms. Do we count Upper and Lower Egyptians as Egyptians? Or were they only Egyptians after the kingdoms had been unified? And what about the continuity of their culture? For much of its history, Egypt has been subject to one empire or another and exposed to significant outside influence. The religion of the Egyptians has changed over time, from pagan to Christian to Muslim. The Egyptian language, Coptic, dropped out of everyday usage around the 17th century and for a time survived only as a religious language, although attempts have been made to revive it. There is really no comparison between the Egyptians and the Jews. Indeed, the Egyptians of Abraham’s time have disappeared: they have been absorbed into the Muslim race. Answer: Historical records of China date back to the Shang dynasty, which began about 1600 BC. Abraham lived around 2000 BC, so the Jews beat the Chinks by about 400 years. The Xia dynasty supposedly goes back further (around 2070 BC), but there are no historical records from that time and the stories that survive from that period are shrouded in myth. Answer: The maker of the video was kind enough to include a picture to illustrate his point. Compare an ancient Greek with a modern one. Around the year 30 AD Jesus made at least five verifiable statements about the future of the Jews recorded in Luke 21. 1. Jerusalem would be destroyed . . . In 70 AD Jerusalem was destroyed. Answer: Probably. Luke never knew Jesus during His earthly ministry, but he recorded what other people said He said. Lk 12:20 And when ye shall see Jerusalem compassed with armies, then know that the desolation thereof is nigh. What were the odds that a major city in ancient world would be besieged sometime in the next several decades? 2. The Jews would be dispersed. The Jewish people were forced out and prevented from returning to their homeland from 70 AD until 1989. 3. The Jews would be brutalized everywhere. The Jews endured countless persecutions through the last 2,000 years. The best known are the pogroms in the late 1800s and early 1900s and the Holocaust in the 1930s and 40s. Answer: Yes, but there’s no denying they became more dispersed after the Roman reprisals that took place between 66-136 AD. Answer: The Jews are unique. The Gypsies have not been dispersed for as long as the Jews and they merely endured a Holocaust lite compared with the Jews, as the graph below shows. As for the Armenians, there is credible doubt as to whether they ever endured genocide. What are the odds that someone living in the first century could have accurately predicted that a particular ethnic group would suffer persecution sometime over the next 2,000 years? I don’t have any more questions from atheists at this point, but I would just like to make a few closing comments on the video. 4. Jerusalem would be controlled by Gentiles. 5. Jews would regain control of Jerusalem. How could Jesus have predicted that a city in the ancient world would one day be controlled by a foreign power but that the inhabitants would again one day regain control? The return of a people to their homeland after diaspora is historically unprecedented – at least since former African American slaves colonized Liberia and (before that) since the Jews returned to their homeland the first time from the Babylonian captivity. Jews exist; therefore the Bible is true and God exists.